Oasis of the Seas. The ship that started it all. One of the most common questions I get asked by those I meet on board (and others) is how? or why did this journey begin. It's a longish tale, so please bear with me. 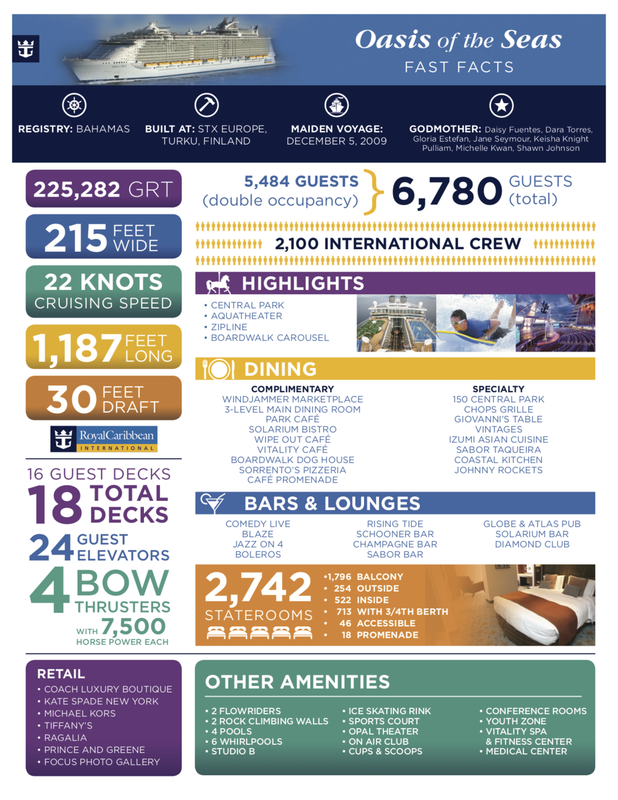 So TL:DR Oasis of the Seas inspired this journey. For those who are still with me. For the best part of the past 18 years (ie to date pretty much all of the 21st Century) I lived in Japan, for most of that time I was an English teacher. One of the issues with learning English (and Japanese for that matter) is that counting isn't a straight forward translation. (This gets a little convoluted, so please bear with me). 1 = 1 and 10 = 10 but when you start getting to larger numbers things begin to get funky. It's all easy to the low thousands, but after you reach the 10's of thousands Japanese counting begins to mess with counting as you know it, because 10,000 is a new base, meanwhile in English we count all the way to a million, in Japanese you count from 10,000 (man) to 100,000,000 (oku) to get a different base. For learners in both languages it takes time to work out what 225,282 is (apart from the Gross Tonnage of Oasis of the Seas). So in early 2010 I came across an article discussing the Oasis. The tonnage, the number of guests, staff, food consumed, length of the ship, fuel used, etc. It was, at the time, the worlds biggest cruise ship and the article was dripping in big numbers. It was and is an amazing feat of engineering and some thing many of my students would enjoy discussing. I turned it into an English lesson. And every student I had over the next few weeks got to read about and discuss the Oasis of the Seas. Every lesson we talked about her, what it would be like to sail on, what were the ports like, it was one of my favourite lessons. Before long I really wanted to sail on her. But she was in Florida, and I was in Japan, so this wasn't happening any time soon. In 2016 I found myself in America for a few months, and I was sort of lost between dates on what to do. Go to Florida and Disney World and the other theme parks? Go to New York? Rent a car and go for a road trip? Florida... hmmm what is about Florida.... there was an itch of a memory... but it bugged me for days on end. And then one night Bingo!! Oasis of the Seas. A cruise!! I can go on a cruise!! So I hit the internet to find out when and how much it was to sail on her. Allure of the Seas My first cruise. To my surprise there was a newer and (by not much) bigger ship, the Allure of the Seas. Well that's it, I would have to book a holiday with her. So I did. I booked a 1 week Caribbean cruise. It was a bit pricer than I would have liked, so I teamed up with my friend from Japan to spilt the cost and we went on my first cruise. Yes, my first cruise was on the then biggest cruise ship in the world, and I had no idea what to expect. It was a great week, and I enjoyed it immensely. But I was pretty sure I wouldn't do another cruise without getting a few friends together, or at least a girlfriend to go with me. Solo cruising was not for me. But I wrong, so very very wrong.